Have you heard? The Jeep lineup is getting a truck and it’s based on the Wrangler. It’s called the Jeep Gladiator and it is set to be the most unique truck available on the market today. It combines the rugged and capable Wrangler attitude with the capability of a truck to become something even better than what other mid-size trucks have to offer. When they become available, you can get a 2020 Jeep Gladiator in Edmonton, AB at Stony Plain Chrysler. We have an impressive Jeep inventory already, and we can’t wait to get our customers behind the wheel of a new Gladiator soon. You can check to see if we have Gladiator models in stock with the link below or you can keep reading to learn why the Gladiator is so impressive and so unique. When you combine a Jeep Wrangler with a mid-size truck, you get the most-capable mid-size pickup ever. It offers best-in-class towing capability at up to 3,470 kg (7,650 pounds), best-in-class payload capability at up to 725 kg (1,600 pounds), and as you would expect from something that shares Wrangler DNA it has best-in-class departure, approach, and breakover angles along with ground clearance. Also, every Gladiator model will have four-wheel drive standard. Under the hood, it packs a 3.6-liter Pentastar V6 engine with 285 horsepower and 260 pound-feet of torque. That engine is available mated to either a 6-speed manual or an 8-speed automatic. Standard, it features a full cab with seating for five and a five-foot steel bed with a three-position tailgate. What’s even more impressive is that, like the Wrangler, the Gladiator features a removable roof, removable doors and a fold-flat front windshield on all models. This makes it the only open-air pickup available on the market today. Also, like the Wrangler, you can get the Gladiator with either a soft-top or a hardtop. Not only is the Jeep Gladiator loaded with capability, but it is also loaded with features too. You can get the Gladiator with Apple CarPlay and Android Auto, an 8.4-inch touchscreen, SiriusXM satellite radio with Travel Link, adaptive cruise control, forward collision warning, a blind spot monitoring system, and more. The Jeep Gladiator will be available in three trims for 2020 starting with the Sport S and going up from there with the Overland and the top Rubicon. All will include the same engine but generally, the Overland trim includes more technology and the Rubicon trim adds more off-road features including 33-inch off-road tires, rock rails, performance shock absorbers, and more. 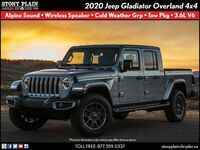 Interested in a 2020 Jeep Gladiator?